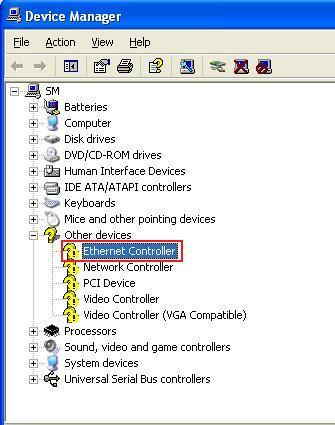 There are several approaches to identify and fix Unknown Device problems, and one of them, which is being practiced by many PC users, is a manual identification of an Unknown Device and its driver download. This is the procedure that we will talk about throughout our discussion. In our example, you will notice that there are multiple unknown devices. Similar cases occur after a fresh installation of Operating System (OS) because of missing device drivers. 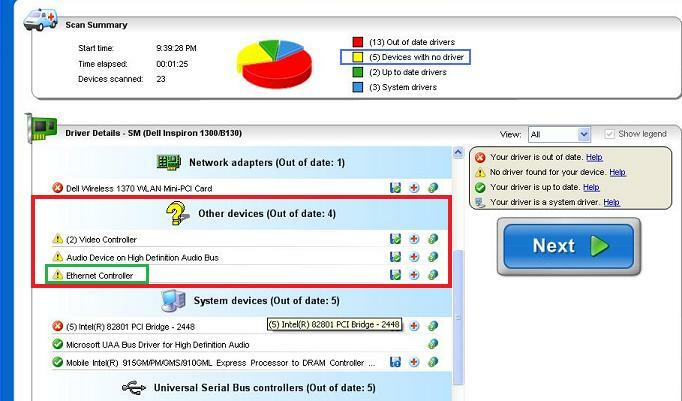 Other causes of Unknown Devices are damaged or corrupted device drivers, and sometimes even outdated drivers. Similar format of data will be provided for every hardware device, and what we need are the values of VEN_**** and DEV_****, which stands for Vendor ID and Device ID. 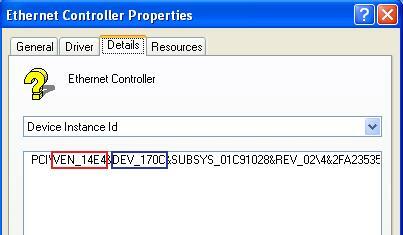 In our example, Vendor ID is 14E4 and Device ID is 170C. These are the IDs we will use to search online to identify the manufacturer, exact device name, and download device drivers. 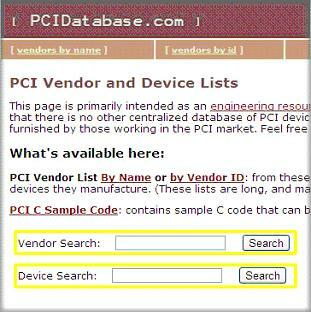 One helpful online database is PCIdatabase.com, which will let you do “Device Search” and “Vendor Search” by just using the IDs obtained from the alphanumeric data. PCIdatabase provides additional information regarding hardware devices, specifically the official website of your hardware (if available). We should use both the Device and Vendor Search to make sure we have the right vendor and device, since some devices share the same device ID. Using the Vendor ID from our example for the “Vendor Search” which is 14E4, the following result has been provided. Clicking the link of the provided Vendor Name will lead us to a page with additional information of the device and a list of devices associated with the vendor ID (14E4). In our example, the information included in the provided “Vendor Details” includes the official web site of the device manufacturer. Before visiting the provided URL address, let us identify the exact device name by using the Device ID (170C) in the “Device Search”. After matching the results, we can be certain that the manufacturer of this device is Broadcom, but we are still lacking some device details (for many devices you will be able to get adequate information in the “Chip Description” column). 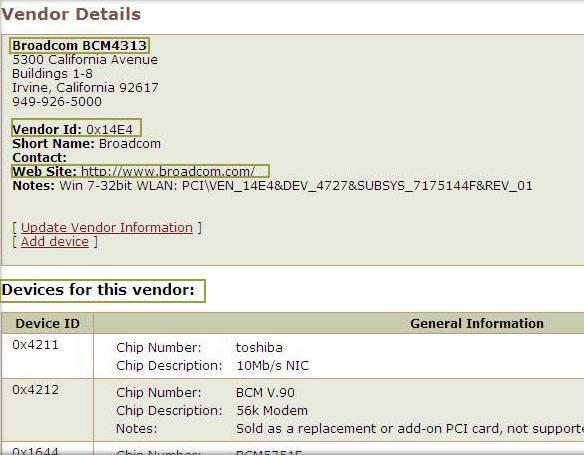 Now, we want to click again on the Vendor Name and then look for the Device ID 0x170C listing by scrolling down the list of Broadcom devices – Broadcom is the manufacturer of many chips and devices. Now, we see very important information under “Notes”, which is the exact page on Broadcom’s website. 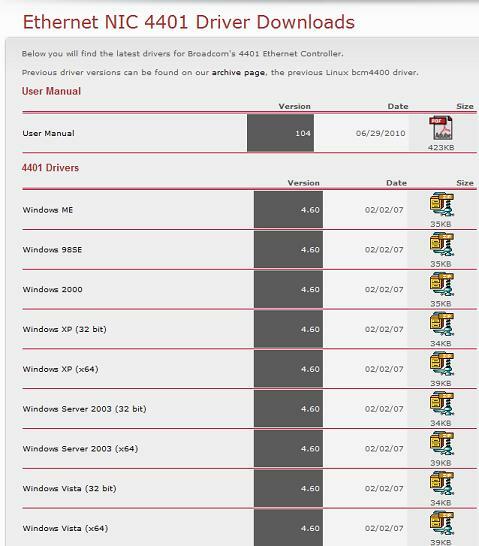 This is great, because we want to always make sure to download device drivers from official manufacturers’ website to prevent any problems such as malwares and computer viruses, and even incorrect device drivers. Also, we can see that device is identified as an Ethernet NIC from the 4401 Series (Broadcom 4401 Ethernet Controller). Remember that websites differ in their procedures for downloading device drivers. In some cases, you will only be given a manufactures’ website and then you will have to be observant to look for device detail or driver download links and buttons. Look for your Operating System, then click on the zip icon to download the zip file, and you can actually download a User Manual. Unzip the downloaded files and run the driver setup application or follow the more detailed instructions within the User Manual. Once again, manufacturer websites differ in the procedures of Driver Downloads. This was the example of the Unknown device that happened to be the Broadcom 4401 Ethernet Controller.